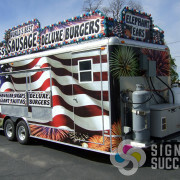 Vehicle wraps generate leads and drive sales (no pun intended). 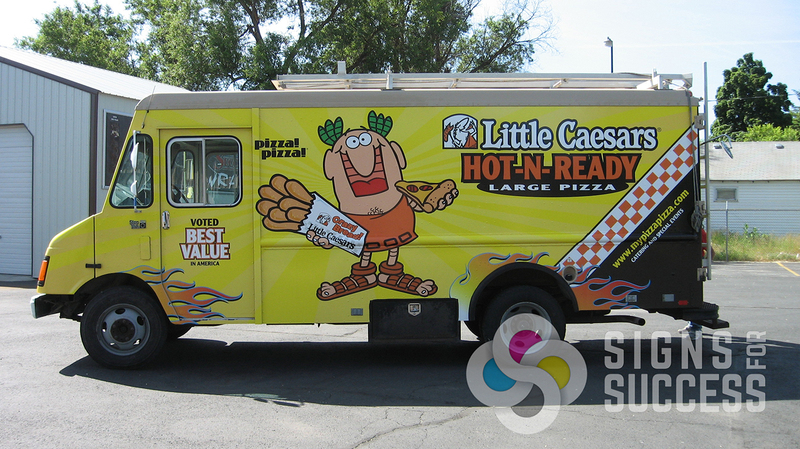 Driving his Little Caesar’s Step Van with a brand new van wrap, Brandt Williams of Little Caesar’s Hillyard noticed he was drawing quite a response from other drivers around him. “Just on the drive from your store to my store, there were so many people honking at us,” Brandt said. The Signs for Success Production Manager was driving with her son this week when they saw the Little Caesars van. “My son was ecstatic. He was like, “Whoa, look at that!” We took a picture.” In its first week, the van wraps even brought in a new customer when someone saw it parked and called to ask about catering for a party. 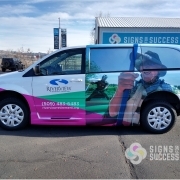 Vehicle wraps are arguably the best form of advertising out there. Vehicle graphics generate up to 70,000 impressions per day wherever they go with a 96% recall rate among those tens of thousands of consumers. Since our vehicle wraps last 5-7 years, that’s a proven effective advertising campaign that works for you 24/7 for at least 5 years! 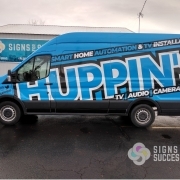 In addition, van wraps, box truck wraps, and other vehicle graphics boost brand recognition and consumers’ confidence in your business. 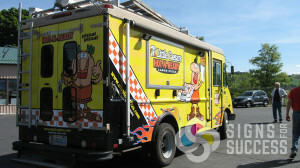 Van wraps are memorable and will lead to sales. First, we take the type of vehicle into consideration. We take pictures of the vehicle and take measurements of doors, sides, windows, hood, front, back – whatever the vehicle wrap might touch. In the design phase, we take any graphics, text, or ideas the customer has and create a custom wrap design that can be applied to a three-dimensional diagram of the vehicle. The customer receives a proof, and minor adjustments may be made. Following customer approval, the design goes to print. In the printing stage, files are double checked for consistency. The machine is loaded, and our Onyx software splits the file into several panels for printing. The Little Caesar’s van wrap required 14 different panels. The panels are then laminated and set aside in order to be installed. 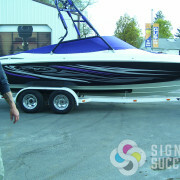 We install most vehicle wraps, whether it’s a car wrap, truck wrap or even boat wrap, right here in our facility. First, the vehicle is prepped by removing any features that will inhibit installation. 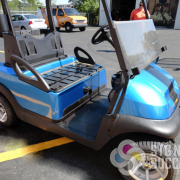 For this particular job, mirrors, windshield wipers, rear lights, license plates, ladder, electrical outlet covers, door stoppers, awning arms, emblems, and rear door latches all had to be removed. 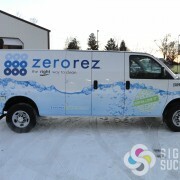 The vinyl is then installed on the clean vehicle starting from the back of one side and moving up, which ensures the longest life of the vinyl wrap. 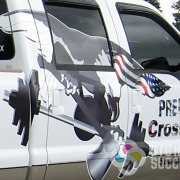 Installation takes several hours as the vinyl is carefully placed and smoothed, and fine cuts are made around lights, door handles, and any other features on the vehicle. Our installers are Avery Car Wrap Certified, so they are trained to be both precise and efficient with each installation. With the vinyl in place, it is heated to 160 degrees Fahrenheit and smoothed once more. As it cools, it retains its permanent shape and position. 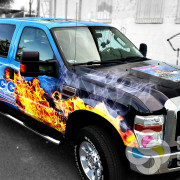 The end result is a seamless, professional vehicle wrap.